The Milton of Leys proposal for a new Highland jail. An Inverness politician has claimed that Scottish Government ministers could save taxpayers millions of pounds by securing a publicly-owned site for a new city jail. The call was made after it emerged that the Scottish Prison Service’s first choice for a replacement Porterfield facility was land at the former Beechwood Farm, which is now the location of the UHI college campus. Development agency Highlands and Islands Enterprise (HIE) spurned an approach in 2009 because the land was zoned for the campus. The SPS’s ambitions for Milton of Leys, on the opposite side of the A9, was far down a list of a dozen options and sparked a storm of local protest after confirmation that it was now the favoured site. Independent city councillor Jim Crawford said: “When the SPS made the approach it had earmarked 12 sites, of which Milton of Leys didn’t even come in the top six. “They had their experts look at Milton of Leys, who came back and said it wasn’t suitable for a prison. The preferred site was on HIE-owned land. A spokesman for HIE confirmed that it rejected the prison service’s approach. He said: “The land is part of a future phase of the campus. That’s the sticking point. We declined to sell because it’s been earmarked for economic development as part of the wider Inverness campus project. 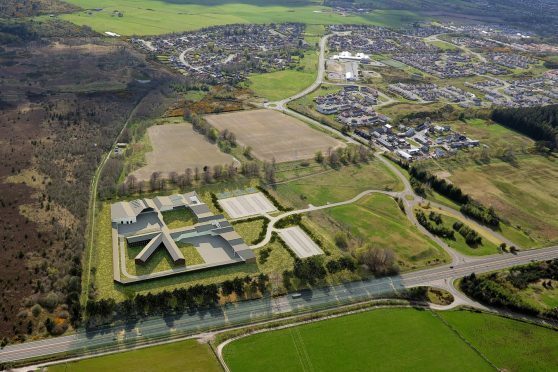 Local MSP Fergus Ewing last month (MAY) urged SPS chief executive Colin McConnell to seek an alternative site to Milton of Leys for the £66million facility that will replace outdated and overcrowded Porterfield. A spokesman for the SPS said: “We’re considering all of the things that have been said to us in the light of the consultation exercise. We want to be a good neighbour. Arrangements are being made for a further public exhibition on the Milton of Leys proposal prior to a planning application being submitted to Highland Council.